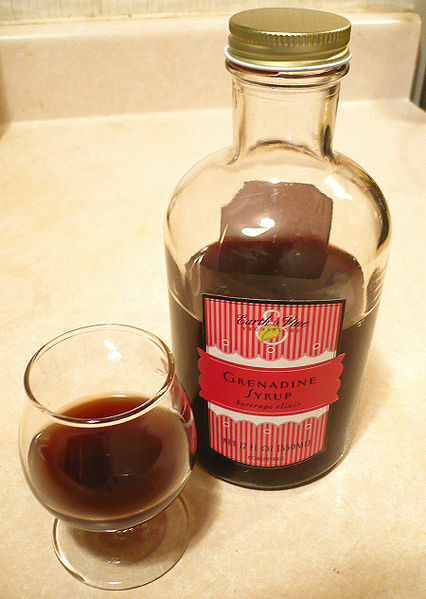 Grenadine is traditionally a red syrup. It is used as an ingredient in cocktails, both for its flavor and to give a reddish/pink tinge to mixed drinks. "Grenadines" are also made by mixing the syrup with cold water in a glass or pitcher, sometimes with ice. The name "grenadine" comes from the French word grenade which means pomegranate. Grenadine was originally prepared from pomegranate juice or cherry juice, and sugar. Left: A bottle of commercially available grenadine. However, "grenadine" is also a common name applied to syrups and beverages consisting of other fruit juices (e.g. raspberry, redcurrant, blackberry) and sugar syrup. The characteristic flavor can be obtained from a mixture of blackcurrant juice and other fruit juices with the blackcurrant flavor dominating. The food industry, however, has widely replaced grenadine fruit bases with artificial ingredients. The Mott's brand "Rose's", by far the most common grenadine brand in the United States, is now formulated entirely out of a high-fructose corn syrup base. Grenadine can be created by simmering pomegranate juice for 15 minutes on the stove, then adding superfine sugar. Grenadine can also be quickly prepared "cold" by adding superfine sugar to cold pomegranate juice, then shaking vigorously for a few minutes. Grenadine syrup is commonly used to mix "cherry" Coca-Colas (also called Grenadinis or Roy Rogers cocktails), pink lemonade, Shirley Temple cocktails, Tequila Sunrises, Cherry Bombs (Bailey's, Kahlua and Grenadine) and flavor-soaked cherries, making them bright red. These are in turn often used in fruitcakes. It can also be added to a Mimosa to give it a red and orange color. Grenadine can also be combined with beer. In North America a combination of beer and grenadine is commonly known as a 'Queen Mary.' A bière grenadine or Monaco, as the combination is known in the French-speaking precincts there, has been popular in Europe for many decades, since at least the Second World War, and perhaps earlier; specifically, a mix of blonde ale and grenadine is called a "Tango", and a mix of beer and lemonade (basically, a shandy or a "panaché") with grenadine is a "Monaco".